I'm glad it's been so long since I had seen the movie as I started this book, and that I've only seen it once. Many things were forgotten and therefore were awesome surprises when I read them. It was a fantastic story and the dinosaurs were terrifying. I liked the slow build as we see little glimpses of dinosaur attacks before everyone gets to the island and then once they're all there everything is fine and amazing for a while. Even then there still seems to be a looming tension, a sense of foreboding where you're just waiting for something to go wrong. When you finally do get to a scene where a character confronts a dinosaur stuff gets really pretty quick. These animals are amazingly powerful and having a confrontation with one most likely means death. The deaths are gruesome in this book and each one that happens makes you that much more afraid for the characters you're growing to love. 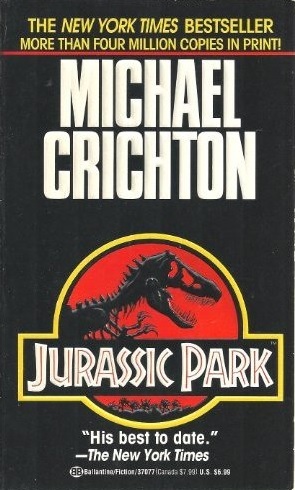 I loved how Crichton wrote the dinosaurs. There are no illusions that they are extremely dangerous creatures that must be treated accordingly. Every time a character had to face a dinosaur in this book it seemed like they were going to die, and many times they do. It makes for a lot of really exciting and tense scenes. Some where everything is loud and they're running or driving away for their lives. Other scenes were more of a quiet intensity, where one wrong move could reveal the character to the dinosaurs and then it would be all over. This was my first book by Michael Crichton but it won't be the last. I look forward to reading more of his work. I can't wait to see what's in store for his characters in his other books. Have you read Jurassic Park? What did you think? 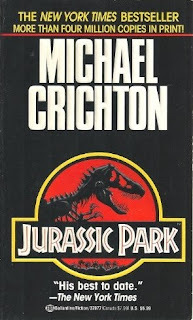 What other Michael Crichton books are awesome? Which one should I read next? Thanks for stopping by!